Sign up with your email address to receive new content, updates and more! Many travelers find themselves starting their journey in South East Asia by way of the great city of Bangkok Thailand. In particular, they arrive directly to Suvarnabhumi Airport (BKK) as this is where most find the cheapest roundtrip tickets! 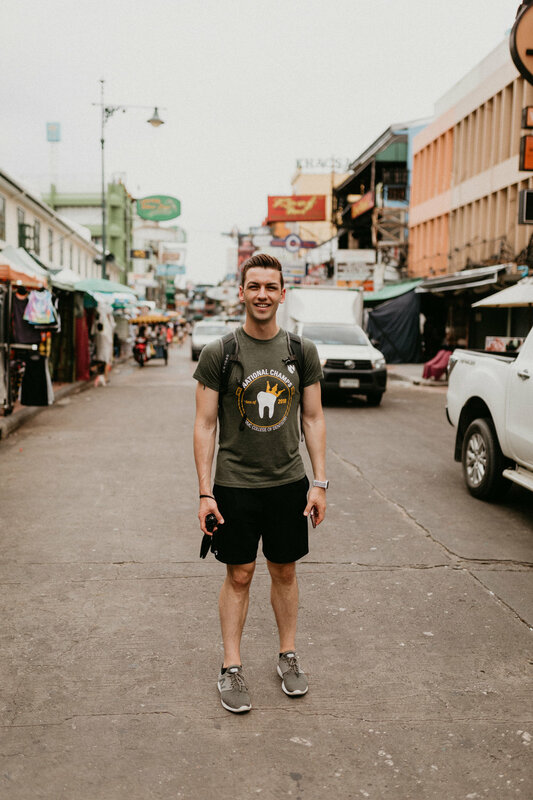 My husband Michael and I flew into Bangkok with smiles on our faces as we started our honeymoon and our first adventure in Thailand! 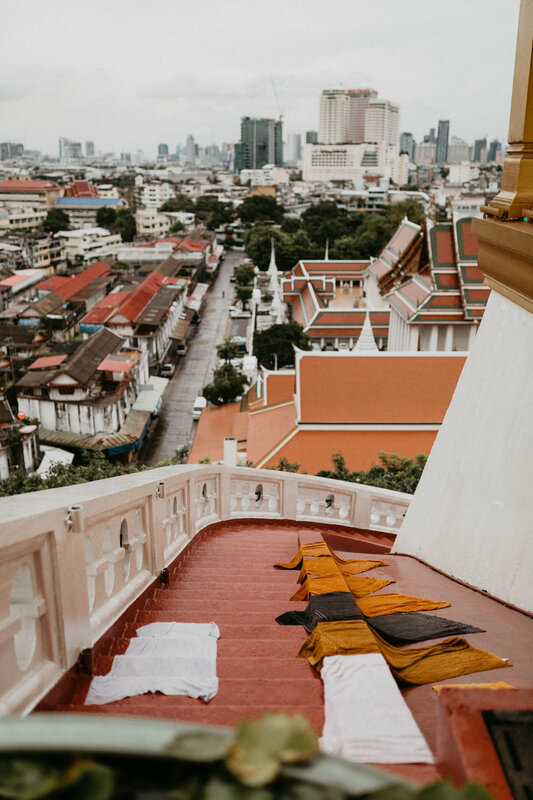 With the chaos of planning a wedding, graduating, and moving cities we didn't have too much time to plan what we would do on the trip, let alone our first day in Bangkok. Really, we just knew that we wanted to see as much of the city as possible with the little amount of time we had allotted there. And with that, we set off! This is where online blogs (like the one you're reading) came in handy! We were so excited to visit Thailand we decided to film our honeymoon! If you want to see all the locations listed below, watch our new video! Transport in Bangkok was a bit chaotic at first. There are motorcycles and mopeds everywhere, apart from the classic tuk-tuks! You can expect to pay $3-4 to get a ride to just about anywhere, but beware of scams and "deals" where tuk-tuk drivers will take you to all of their friends suit-tailor shops where you could be stuck for hours. No matter what time of the day you land at BKK you will want to exchange some currency for Thai Baht. Most street vendors, shops, and transit only accept cash. You can find many places straight outside of security at BKK to exchange your money so be sure to do a little shopping around before going to the first place you see. Next, buy a Thai SIM card for your cell phone. You'll thank yourself later when you're trying to find your way around the city! We chose AIS as our research said the speeds were excellent and they had the most extensive coverage. Many streets are unmarked, and it can be extremely difficult to use a paper map to find your way around the twists and turns of the city. Google Maps might be your best friend this trip, especially when telling taxi and tuk-tuk drivers exactly where you need to go. The countless over-priced taxi services located just beyond the doors of the airport aren't your only option. With your new SIM card, you can arrange a ride with Grab Taxi to your accommodation. Michael and I used Grab Taxi extensively while staying in Thailand. We found the rides to be comfortable, AIR CONDITIONED and the drivers knowledgable and efficient in their navigating. The biggest perk is not needing to translate or explain where you are going as the app works just like Über or Lyft where you can enter your destination address prior to pickup so there is no confusion! The drivers are navigating streets far more complicated than we are used to in the U.S. so pickup times can be anywhere from 2-15 minutes even in the heart of the city, but we found it to be our favorite mode of transportation from place to place. There are also tuk-tuks available, which are fun to try at least a time or two, but I wouldn't recommend taking one if you are traveling far distances. 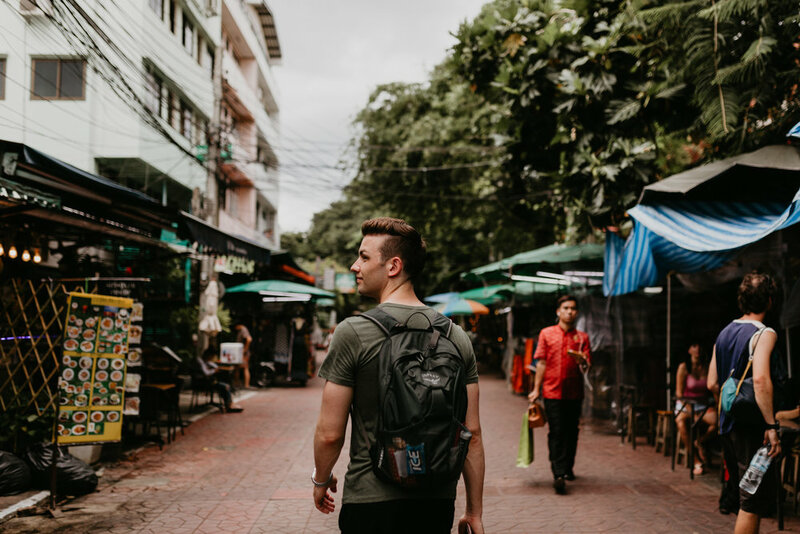 An extremely popular part of the OId City and Bangkok in general, Khao San Road runs through the center of the Old City and is lined with many grungy hostels, cute cafes, street food carts, and more. This is a backpacker's gold mine, and thus is known for being overcrowded with expats and tourists. You'll find some of the most overpriced street food, clothing items, and souvenirs on the street - but it's a great area to visit, meet people, and stay if you like the free-spirited backpacker vibe. We found Khao San road west of Chakrabongse road to be a more laid back, enjoyable place to walk, stay or eat. East of Chakrabongse road is more lively, shopping centric and a haven for tuk tuk drivers to lure you into a ride around town. If you are a male, you will also get askedat least seven times if you want to buy a suit with a single pass. Michael & I stayed about 10 to 15 minutes walk from Khao San Road at Casa Nithra. We wanted to be in the Old City, but not overcome by the noise and bustle of Khao San. This little boutique hotel was extremely welcoming, clean, had delicious food, and a gorgeous pool complete with city views. 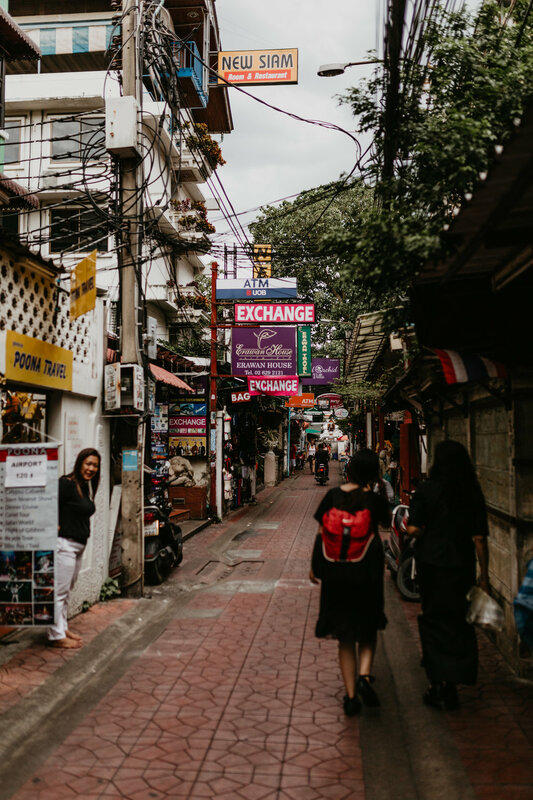 You'll find tons to explore down Khao San, and it can easily take up a good portion of your day. But don't let that keep you. 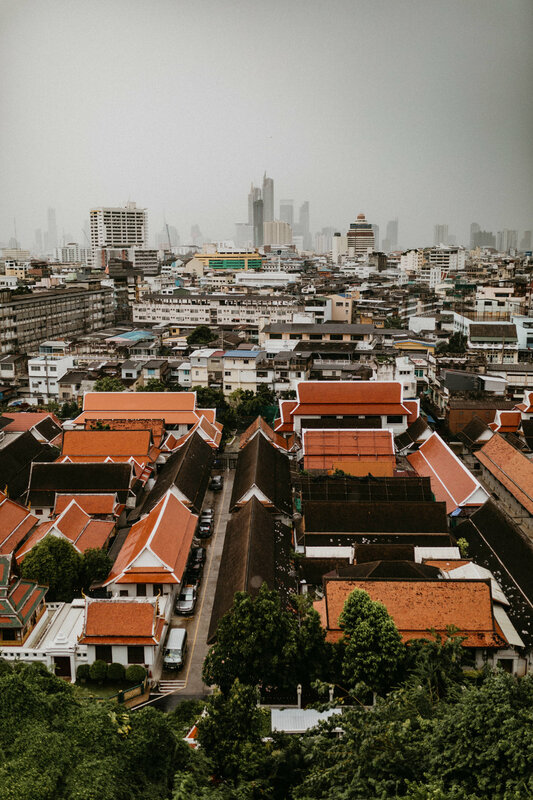 There is so much to explore in Bangkok, and Khao San is just a tiny piece. It should take up as little of your precious time as possible! Catch a tuk-tuk or taxi and make your way to the temples! If there's one place to get the best view of Bangkok, this is that place. Not only is the structure historically and religiously important, but the hike up it's 318 steps gives one the meditative head-space to truly enjoy the view at the top. The temple itself is gorgeous, and as you'll see, there are many locals and tourists alike taking in it's beauty. This was one of our favorite temples that we visited. Everything from the many bells and gongs you can freely ring, to the greenery surrounding the mountain you may enjoy as you hike. Lucky for us, Bangkok is built on a river, cutting the city into two. What better way to escape the heat than to make your way down to the Chao Phraya and a take a ride to the other side? There are plenty of docks with boats running a regular, albeit this structured schedule can be difficult to find if you're trying to figure out when the next boat is arriving or departing. Be careful of scammers as you go, and make sure to depart from an official dock. You'll definitely appreciate experiencing the city from an entirely different perspective. Rides from one side to the other shouldn't cost any more than a couple of dollars. The one we used to transfer from one side to the other was even less than $1. There are long boats, larger boats, and some with covers available depending on where you dock. We took a boat from Wat Arun back to the Old City near where the Flower Market is held. You can see Wat Arun's great white Prang from a distance, and it is one of the structures that really makes Bangkok's skyline along the riverside identifiable. Wat Arun is also known as The Temple of Dawn. Decorated with porcelain, emerald and gold, the carvings and patterns on it's striking spiky structure set it apart from the other wats around the Old City. It's really a beautiful spectacle to enjoy. There are many staircases around the base of the structure that you may freely explore. Visit earlier in the morning or later in the evening to avoid crowds. Look up exact hours and entry costs (usually just a few bucks) on Google Maps. There are so many temples to visit around Bangkok, but Wat Pho (also known as Wat Po) is amongst the best. This is the famous Temple of the Reclining Buddha. Believe me, this place is awe inspiring. Unlike Wat Arun, Wat Pho is covered in bright greens, blues, and burnt orange coloring. It also has beautifully shaped shrubs and statues carefully placed throughout the temple grounds. It's main attraction, The Reclining Buddha, usually has a queue to access the temple, but is well worth it. Walk amongst the colored prangs, burn incense, join those meditating, or simply take a seat at one of the many benches and simply enjoy the gorgeous architecture. This literally just skims the surface of everything that you must experience with a short amount of time in Bangkok. Not to mention the quintessential Grand Palace and Temple of the Emerald Buddha! This small sample is just from what Michael and I were able to cover within our first day. We set out strong, wanting to see over 4 temples and multiple historic sites around the city, but as you may experience - it takes a while to get around, and A LOT of energy! We can't wait to share more of the great places we visited in Bangkok and beyond. Thank you for reading! For more, be sure to subscribe to our newsletter and check out our Instagram to see what's new!